A microquasar has been discovered in the nearby galaxy NGC 7793. In these systems, a stellar-mass black hole is being fed by a companion star. The black hole in the microquasar is generating two powerful jets, which are blowing outward and creating huge bubbles of hot gas. Microquasars are miniature versions of powerful quasars in distant galaxies and therefore useful to study. This composite image shows a powerful microquasar containing a black hole in the outskirts of the nearby (12.7 million light years) galaxy NGC 7793. The large image contains data from the Chandra X-ray Observatory in red, green and blue, optical data from the Very Large Telescope in light blue, and optical emission by hydrogen ("H-alpha") from the CTIO 1.5-m telescope in gold. The upper inset shows a close-up of the X-ray image of the microquasar, which is a system containing a stellar-mass black hole being fed by a companion star. Gas swirling toward the black hole forms a disk around the black hole. Twisted magnetic fields in the disk generate strong electromagnetic forces that propel some of the gas away from the disk at high speeds in two jets, creating a huge bubble of hot gas about 1,000 light years across. 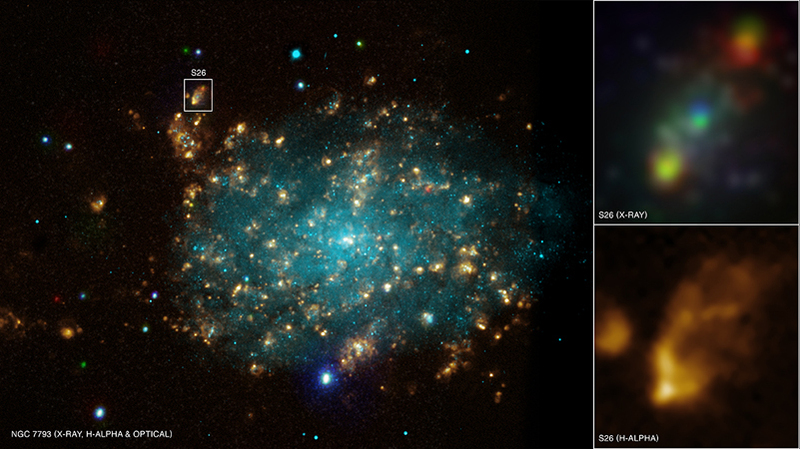 The faint green/blue source near the middle of the upper inset image corresponds to the position of the black hole, while the red/yellow (upper right) and yellow (lower left) sources correspond to spots where the jets are plowing into surrounding gas and heating it. The nebula produced by energy from the jets is clearly seen in the H-alpha image shown in the lower inset. The jets in the NGC 7793 microquasar are the most powerful ever seen from a stellar-mass black hole and the data show that a surprising amount of energy from the black hole is being carried away by the jets, rather than by radiation from material being pulled inward. The power of the jets is estimated to be about ten times larger than that of the very powerful ones seen from the famous microquasar in our own galaxy, SS433. 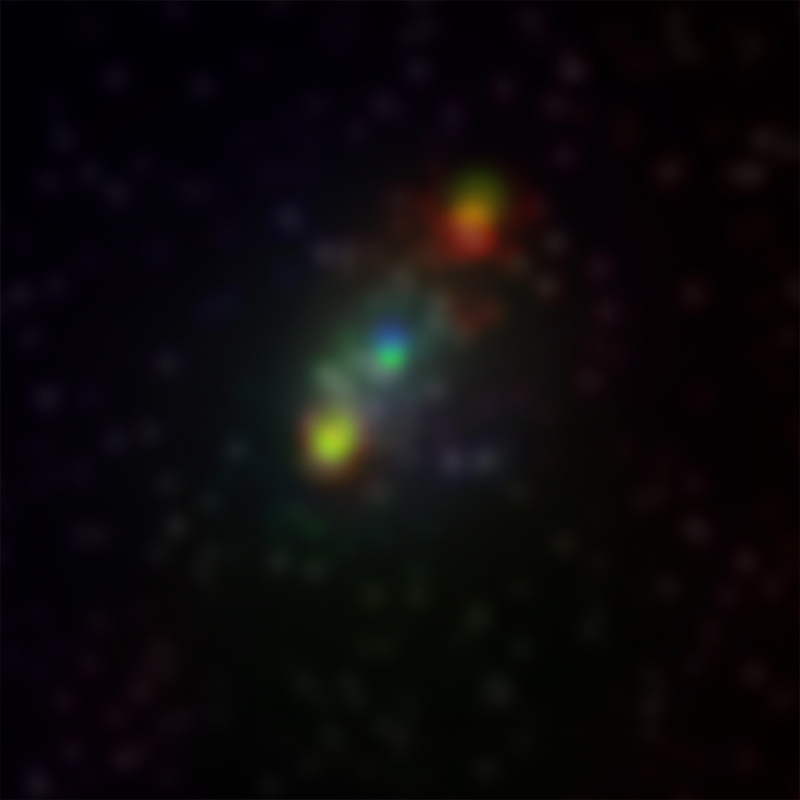 This system in NGC 7793 is a miniature version of the powerful quasars and radio galaxies, which contain black holes that range from millions to billions of times the mass of the Sun. A paper describing this work is being published in the July 8th, 2010, issue of Nature. The authors are Manfred Pakull from the University of Strasbourg in France, Roberto Soria from University College London, and Christian Motch, also from the University of Strasbourg. Coordinates (J2000) RA 23h 57m 49.8s | Dec -32° 35' 29.5"
References M.Pakull et al., 2010, Nature, in press. Truly an amazing discovery. What I like the best is the explanation provided with the images. With the simplicity of the explanation, even an amateur student of Astrophysics can understand the strange events that occur in the universe. Thanks to NASA and the authors for spreading the knowledge. Thanks NASA, keep up the good work. Amazing and wonderful all your discoveries NASA. I would like to read more about black holes and quasars. Thank you very much. 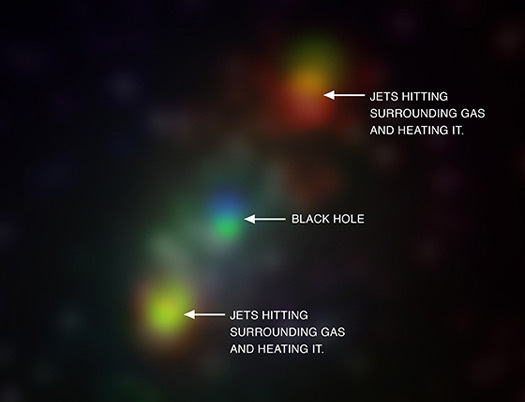 The most powerful pair of jets ever seen from a stellar black hole. About 12.7 million light years from Earth. X-rays from Chandra were overlaid on optical data from the VLT and h-alpha data from CTIO. About 34,000 light years across. X-rays are red, blue and green, optical is cyan and h-alpha is gold. In the constellation Sculptor visible in the Southern Hemisphere.